Feeding aquarium fish the correct type and amount of food is critical to maintaining good health. There is a huge variety of fish food available for feeding tropical fish. The different types and their uses are outlined below. Flaked fish food is one of the most popular types of food for feeding tropical fish. It's ideal for small to medium fish, including most general community fish such as tetras, barbs and livebearers. Lots of manufacturers produce a flake food, so a huge number of brands and variations are available. A general tropical flake food from a reputable manufacturer will provide a good staple diet for most fish, but it is still a good idea to provide variety in the diet, both by using different brands and flake types, and by using other types of food listed below. As well as general tropical flake, there are colour enhancing flakes to boost the natural colours of fish, and many manufacturers produce other variations such as veggie formulas for herbivorous fishes (such as many livebearers, Malawi mbuna cichlids, etc). Granulated and micro-pellet fish foods are also popular, with an increasing number being developed in recent years. These provide an excellent alternative to flake to help vary the diet, and many types sink through the water a bit faster, so are ideal for midwater and bottom-feeding fish. This means that in addition to providing variety for midwater fish like barbs and tetras, they are also useful in mixed community tanks containing Corydoras catfish and loaches for example. Granular and pellet foods are also more suitable for autofeeders, as they are much less likely to clog than flake foods. Larger wafer discs and tablet foods are targeted mainly at bottom-feeding fish. They drop through the water more quickly, and are often too large for smaller fish to swallow whole, giving bottom-feeding fish such as catfish and loaches a chance to feed. These foods are also ideal for many suckermouth-type catfish that rasp at the surface of food. Many of these fish would graze for long periods in the wild, and wafer and tablet foods allow them to take in small amounts of food over longer periods, as they would naturally do. Some tablet foods can also be pressed against the glass of the aquarium, to stimulate fish to feed where they can be viewed easily. 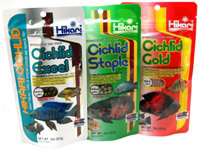 Larger food sticks and floating pellets are ideal for larger fish such as many cichlids. They provide a more substantial food item and will not be lost in the substrate, filter intake, etc as easily as finer foods. Like other foods, many manufacturers produce sticks and pellets aimed at either herbivores or carnivores. Omnivorous fish will of course benefit from rotating both types. Freeze-dried fish foods offer a way of feeding natural foods such as Tubifex and Bloodworm that is safer than live foods and often more convenient than frozen foods. Foods such as freeze-dried bloodworm tend to float, so are ideal for fish that often feed at or near the surface such as gouramies, hatchetfish and the African butterfly fish. Freeze-dried tubifex is often available in a cube form that can be pressed against the front glass of the aquarium, encouraging the fish to feed in full view. Frozen foods are ideal as a treat food for many tropical fish, and useful for feeding fish that don't readily take dry foods. A wide variety is available. Some are useful for smaller fish or babies, such as cyclops, daphnia and baby brine shrimp. Others are suitable for medium-sized fish and include bloodworm, adult brine shrimp, mysis, krill, black mosquito larvae, white mosquito larvae (sometimes called glassworm or whiteworm), veggie formulas and other mixed formulas for cichlids, etc. Frozen foods provide similar nutrition to live foods, but are safer and generally more convenient to use. The use of live foods is not as common these days, probably due to the availability of a wide range of nutritious fish foods. However, some fishkeepers like to feed them as an occasional treat, and it's clear that many fish relish the 'wriggle factor' of live food. In addition, it can be useful for more difficult feeders and certain wild-caught fish that may take a little time to adapt to aquarium foods. The foods most commonly available live (in the UK at least) are bloodworm, brine shrimp and daphnia. Tubifex is not as popular as it once was, as it is collected from polluted mud where it thrives, and has been associated with health issues - it's safer to use freeze-dried or sterilised frozen tubifex. Despite occasional rumours to the contrary, the use of live bloodworm, brine shrimp and daphnia is generally very low-risk, and some reported problems may be due to other factors that were merely coincidence, like the all-too-often overlooked water quality. In some parts of the world, the use of 'feeder' fish (usually goldfish or guppies) is common, though not in the UK. Many are against this practice, either on the grounds of increased disease risk (feeder fish in stores are generally kept in cramped and unhealthy conditions), or because of moral objections to feeding live fish in an aquarium situation, where the prey has no chance to escape the predator. In any case, feeding live fish should be unnecessary with so many other foods available, and there are very, very few fish available for aquariums that can't be weaned onto 'dead' foods with a little patience. A number of household vegetables can be used to supplement the diet of herbivorous and omnivorous fish. In particular, many fishkeepers supplement the diet of Suckermouth catfish (Loricariids, often known simply as 'plecs'/'plecos') in this way - using veggies such as carrot, potato, cucumber, etc. These can be placed in the tank overnight to allow them to graze, and then removed the following morning. Small pieces of household greens/veg can also be fed to any other fish requiring a veggie component in the diet, such as Malawi mbuna cichlids, many livebearers, barbs, scats, etc. There are several foods available specifically for feeding fry and baby fish. These vary from liquid suspension foods that are useful in the early stages and for very small fry, to fine powder formulations. These foods are usually higher in protein to encourage good growth. They should be fed in small amounts, but more frequently. Several times per day is ideal, but remember that this may require additional water changes to keep the water quality high (much better growth rates are normally achieved with frequent large water changes when raising fry). You can also culture your own live foods for fry. These can be very useful for fry that do not readily take prepared foods. They are also economical to use if you breed large numbers of fish. The two most commonly cultured for this purpose are baby brine shrimp and microworms. Holiday feeder blocks have often been controversial. The rate at which they dissolve may be unpredictable, and it's possible that too much food could be released too quickly, leading to water quality problems. However, there are newer types available based on gel blocks which appear to be more stable. Given the enormous number of fish foods now available, there's no excuse not to give your fish plenty of variety and contribute towards their overall health by giving them a nutritious diet. Fish fed an appropriate and varied diet will show better growth rates, better colour, enhanced ability to resist disease and be more likely to breed.